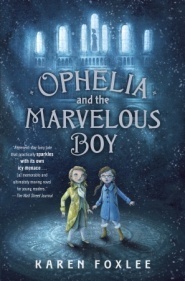 In an afternoon, Karen Foxlee’s Ophelia and the Marvelous Boy carried me off to a magical world of good and evil, involved me in an adventure to save the world, made me laugh and cry, and restored my faith – in a way only a good children’s book can. Coping with the recent death of her mother, Ophelia inadvertently becomes a major character in an updated version of the Snow Queen fairy tale three days before Christmas. The story opens with a prelude describing the evil Queen who has captured and imprisoned the Marvelous Boy; centuries pass and Ophelia discovers the Boy locked in a room in the museum where her father, the world’s greatest expert on swords, is staging an exhibition that will open on Christmas Eve. Through wonderful scenes of mannequins coming to life, giant birds eating sardines, and a wolf chase, Ophelia searches for the missing sword that will destroy the evil Queen who would plunge the world into misery and grief forever. Of course, Ophelia is successful as she finally listens to her heart (and the advice of her mother’s memory) and finds the courage to help her father and sister begin their recovery from grief. When reading this, although those analogies of inner demons freezing out hearts and the discovery of the heroine inside, floated between the lines to my adult brain, I ignored them and thoroughly enjoyed the story as a real fairy tale. Throughout the tale, Ophelia’s dead mother whispers advice, and I couldn’t help think how much my own dead mother’s advice is still very much there – she is still in my head too. This entry was posted in authors, book review, books, children's books, children's literature, fantasy, reading and tagged Children's literature, Christmas, dealing with grief, Fairy tale, Karen Foxlee, Ophelia, Ophelia and the Marvelous Boy, Queen, recovering from grief, Snow Queen. Bookmark the permalink.